You forgot to download Mobile Master	. Click the link below to download it. Connect your mobile phone with Mobile Master and there’s a lot you can do from the application’s interface: view and manage data stored on your mobile; read and write text messages; manage your contacts, edit your contacts, back up your contacts; reschedule appointments; enter birthdays in the calendar, and more. The system requirements for running Mobile Master are: 1GHz processor or better; at least 30 MB of free disk space; connection to the mobile phone via cable, infrared or Bluetooth; 32 or 64-bit Windows edition, anything from Windows XP to Windows 8.1. 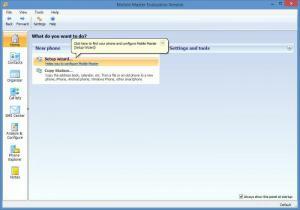 Mobile Master provides support for Samsung, LG, Nokia, Sony Ericson, Motorola, Benq Siemens, and Apple mobile phones. A list of supported devices is available on Mobile-Master.com. The first time you run Mobile Master you are invited to use a setup wizard to find your phone and configure Mobile Master. You will go through the following 7 steps: scan for phone; sync contacts with; options for contacts; more options for contacts; sync calendar with; options for calendar; finish. It must be mentioned here that Mobile Master features several other wizards: copy and transfer data, sync data, back up data, restore data, swap first and last name, enter birthdays in calendar, reschedule appointments, delete data, install phone drivers. There is a lot you can do with Mobile Master: view, edit and manage contacts; load, edit and create calendar events; view, organize, and send SMS; load, edit and create notes; copy files; sync contacts; sync appointments; sync photos and videos; back up and restore data; transfer data from an old to a new phone; and more. Mobile Master is free to use for a trial period of 30 days. A prompt will remind you of this fact every time you launch the application. Back up and restore, sync, manage data stored on your mobile. You can do all these from your Windows PC by using Mobile Master. The system requirements for running Mobile Master are quite low. Lots of wizards: wizard to install the application, wizard to connect your phone, wizard to sync data, wizard to reschedule appointments, and more. Mobile Master has a user friendly interface that can be customized (select the elements that are displayed on the interface). Support for lots of mobile phones is provided. Trial limitations: 30-day trial, only the first 10 items may be written to the phone/address book, nag screen. You can download Mobile Master free here.